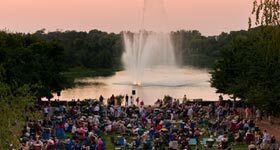 There's something to do every summer night at the Chicago Botanic Garden. The Garden is open until 9 p.m. from June through Labor Day. Free concerts nightly, Monday through Thursday. 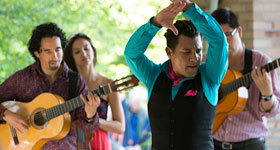 Live music performances that are fun for the whole family. Bring a picnic, dine at the Garden Grille, or the Rose Terrace Beer Garden. Both dining sites have grab & go beverages and food for your convenience. Buy parking in advance or join the Garden for free parking every day of the year. Please note: Picnicking is allowed during the concerts on Monday through Thursday evenings. You are encouraged to bring your own chairs, as the Garden has a limited supply. Set up your picnic any time after 4 p.m. Enjoy an enchanting one-hour musical performance of carillon bells on a warm summer evening and watch lights illuminate Evening Island. Meet the performers and enjoy a free carillon tour and demonstration before the concert. You can even try your hand at ringing the bells. 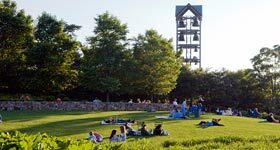 Preconcert carillon tour and demonstration, 5:30 p.m.
Each Tuesday evening brings a different kind of music, from big band to swing to bluegrass. Watch the sun set over the Smith Fountain. Free musical entertainment for the Garden's youngest visitors! Bring the family and enjoy live music in this idyllic summer setting. 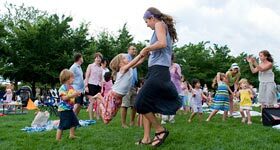 Bring your dancing friends and kick it up a notch with high-energy music as you dance (or listen) to the upbeat tempo of a host of diverse genres. The consumption of alcohol not purchased on the premises is prohibited at the Chicago Botanic Garden. We do have wine and beer for sale in our Garden View Café. Bring it to your picnic. If you are interested in having your band considered for future music programs at the Garden, please send a press kit with samples of your music to Coordinator of Visitor Events & Programs, Chicago Botanic Garden, 1000 Lake Cook Road, Glencoe, Illinois, 60022. All entries will be kept on file and considered when booking future entertainment.